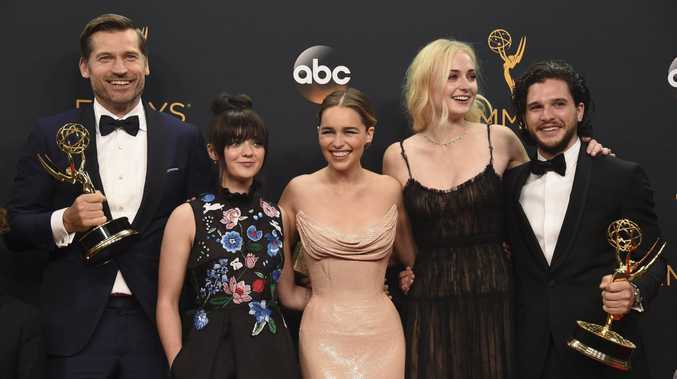 GAME of Thrones was once again named the best drama series of the year at the 68th annual Emmy Awards. HBO's hit fantasy series has now won 38 Emmys from 106 nominations to date after earning a record 23 nominations this year. Cast members including Sophie Turner, Kit Harrington, Maisie Williams, Gwendoline Christie and Iwan Rheon were all in attendance ahead of production commencing on season seven next week in Belfast. Creators David Benioff and DB Weiss also took out the award forOoutstanding Writing for a Drama Series. But today's awards ceremony belonged to the mini-series The People V OJ Simpson: American Crime Story, which was named Outstanding Limited Series and took out the lead actor and actress categories for stars Courtney B Vance and Sarah Paulson. Paulson's date for the night was Marcia Clark, the prosecuting attorney whom she played in the acclaimed mini-series. "I am glad to be able to stand here today in front of everyone and say I'm sorry," Paulson said, referring to Clark's one-dimensional portrayal by the US media during the murder trial. Her co-star Sterling K Brown also won Outstanding Supporting Actor in a Limited Series or Movie, beating out the show's more high-profile nominees John Travolta and David Schwimmer. Host Jimmy Kimmel was widely praise for his work during the three-hour broadcast. The show started with the talk show host trying to catch a lift to the awards show with everyone from James Corden to Julia Louis-Dreyfus and Jeb Bush and Emilia Clarke's dragon from Game of Thrones. In his opening monologue Kimmel blamed reality TV for giving Donald Trump the profile needed to make a bid for the US Presidency. The US election was a recurring theme during the awards show. Julia Louis-Dreyfus, who plays a fictional president on the comedy series Veep, apologised for apparently inspiring this year's dramatic turn of events. "I think Veep has torn down the wall between comedy and politics… it now feels more like a sobering documentary," she said. In his acceptance speech Courtney B Vance also yelled out, "Obama out, Hillary in!" Australian Ben Mendelsohn was a surprise winner, beating out Game of Thrones' Peter Dinklage and Kit Harrington in the Outstanding Supporting Actor in a Drama Series category for his performance in the Netflix series Bloodline. The Melbourne native, who was also nominated for Bloodline last year, wasn't in attendance and presenter Taraji P Henson accepted the gong on his behalf. Other first-time Emmy winners included Mr Robot star Rami Malek, Orphan Black's Tatiana Maslany and Kate McKinnon.